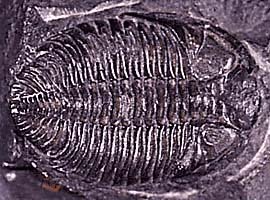 The Silurian (443.7 to 416.0 million years ago)* was a time when the Earth underwent considerable changes that had important repercussions for the environment and life within it. One result of these changes was the melting of large glacial formations. This contributed to a substantial rise in the levels of the major seas. The Silurian witnessed a relative stabilization of the Earth’s general climate, ending the previous pattern of erratic climatic fluctuations. Coral reefs made their first appearance during this time, and the Silurian was also a remarkable time in the evolution of fishes. Not only does this time period mark the wide and rapid spread of jawless fish, but also the highly significant appearances of both the first known freshwater fish as well as the first fish with jaws. It is also at this time that our first good evidence of life on land is preserved, such as relatives of spiders and centipedes, and also the earliest fossils of vascular plants. The Silurian is a time when many biologically significant events occurred. In the oceans, there was a widespread radiation of crinoids, a continued proliferation and expansion of the brachiopods, and the oldest known fossils of coral reefs. As mentioned earlier, this time period also marks the wide and rapid spread of jawless fish, along with the important appearances of both the first known freshwater fish and the appearance of jawed fish. Other marine fossils commonly found throughout the Silurian record include trilobites, graptolites, conodonts, corals, stromatoporoids, and mollusks. On the left, Dalmanites limuluris, a trilobite from the Silurian of New York. To the right, Grammysia cingulata, a bivalve from the Upper Ludlow of England. It is also in the Silurian that we find the first clear evidence of life on land. While it is possible that plants and animals first moved onto the land in the Ordovician, fossils of terrestrial life from that period are fragmentary and difficult to interpret. Silurian strata have provided likely ascomycete fossils (a group of fungi), as well as remains of the first arachnids and centipedes. Perhaps most striking of all biological events in the Silurian was the evolution of vascular plants, which have been the basis of terrestrial ecology since their appearance. Most Silurian plant fossils have been assigned to the genus Cooksonia, a collection of branching-stemmed plants which produced sporangia at their tips. None of these plants had leaves, and some appear to have lacked vascular tissue. 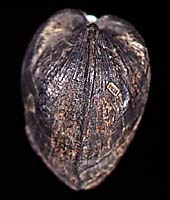 Also from the Silurian of Australia comes a controversial fossil of Baragwanathia, a lycophyte. If such a complex plant with leaves and a fully-developed vascular system was present by this time, then surely plants must have been around already by the Ordovician. In any event, the Silurian was a time for important events in the history of evolution, including many “firsts,” that would prove highly consequential for the future of life on Earth. Cooksonia, on the left, has usually been considered the oldest known land plant. Fossils assigned to several species are known from North America, Europe, Asia, and Africa, and from both the Late Silurian and Early Devonian. The lycophyte Baragwanathia, on the right, is structurally more complex than Cooksonia, but Silurian fossils of this plant have been found in Australia, significantly earlier than in the Northern Hemisphere. The Silurian’s stratigraphy is subdivided into four epochs (from oldest to youngest): the Llandovery, Wenlock, Ludlow, and Pridoli. Each epoch is distinguished from the others by the appearance of new species of graptolites. Graptolites are a group of extinct colonial, aquatic animals that put in their first appearance in the Cambrian Period and persisted into the early Carboniferous. The beginning of the Silurian (and the Llandovery) is marked by the appearance of Parakidograptus acuminatus, a species of graptolite. The Llandovery (443.7-428.2 million years ago*) preserves its fossils in shale, sandstone, and gray mudstone sediment. Its base (beginning) is marked by the appearance of the graptolites Parakidograptus acuminatus and Akidograptus ascensus. The Llandoverian epoch is subdivided into the Rhuddanian, Aeronian, and Telychian stages. At the close of the Telychian stage, the appearance of Cyrtograptus centrifugus marks the start of the Wenlockian epoch (428.2 to 422.9 million years ago). * The fossils are found in siltstone and mudstone under limestone. Missing from the fossil record of the Wenlock was the conodont Pterospathodus amorphognathoides, present in earlier strata. This is an epoch with excellent preservations of brachiopod, coral, trilobite, clam, bryozoan, and crinoid fossils. The Wenlock is subdivided into the Sheinwoodian and Homerian stages. The Ludlow (422.9 to 418.7 million years ago)* consists of siltstone and limestone strata, marked by the appearance of Neodiversograptus nilssoni. There is an abundance of shelly animal fossils. The Gorstian and Ludfordian stages make up the Ludlow epoch. Platy limestone strata rich in cephalopods and bivalves characterize the Pridolian (418.7 to 416.0 million years ago),* the final epoch of the Silurian. It is marked by the appearance of the index fossil Monograptus parultimus, and also by two new species of chitinozoans (marine plankton), Urnochitina urna and Fungochitina kosovensis, which appear at the base or just above the base of the Pridoli. Although there were no major periods of volcanism during the Silurian, the period is marked by major orogenic events in eastern North America and in northwestern Europe (the Caledonian Orogeny), resulting in the formation of the mountain chains there. The ocean basins between the regions known as Laurentia (North America and Greenland), Baltica (central and northern Europe and Scandinavia) and Avalonia (western Europe) closed substantially, continuing a geologic trend that had begun much earlier. The modern Philippine Islands were near the Arctic Circle, while Australia and Scandinavia resided in the tropics; South America and Africa were over the South Pole. While not characterized by dramatic tectonic activity, the Silurian world experienced gradual continental changes that would be the basis for greater global consequences in the future, such as those that created terrestrial ecosystems. A deglaciation and rise in sea levels created many new marine habitats, providing the framework for significant biological events in the evolution of life. Coral reefs, for example, made their first appearance in the fossil record during this time. The Silurian Period’s condition of low continental elevations with a high global stand in sea level can be strongly distinguished from the present-day environment. This is a result of the flood of 65% of the shallow seas in North America during the Llandovery and Wenlock times. The shallow seas ranged from tropical to subtropical in climate. Coral mound reefs with associated carbonate sediments were common in the shallow seas. Due to reduced circulation during the Ludlow and Pridoli times, the process of deposition of evaporites (salts) was set in motion. Some of these deposits are found in northern Europe, Siberia, South China and Australia. Where To Buy Dinosaur Fingerlings, Because They're *Finally* Available In The U.S.
Now, Scientists Think They Know Why Most Ankylosaurs Were Fossilized Belly Up.